« How best to boost urban cycling? This entry was posted on January 7, 2014 at 2:53 pm and is filed under CYCLING PROMOTION, CYCLING THINKING. You can follow any responses to this entry through the RSS 2.0 feed. You can leave a response, or trackback from your own site. Cheers Karl. Until we civilise our villages, towns & cities most people won’t ride; but it’s getting people riding that’s the best way of civilising our villages, towns & cities. We’re beginning to find multiple routes through this ‘Catch 22’; the future’s looking (a bit) more rosy. But I don’t think there’ll ever be a time when we don’t need huge numbers of people working for cycling in many different ways; that’s why we ‘cultural workers for cycling’ aren’t simply one of the routes to the cycling future, we’re an essential part of that future! I think it will take something fairly big to make the transition or to reach the tipping point. I keep praying for another petrol tanker strike :o) but something like that is probably needed. I don’t think even that is sustainable but may make more people see a different way to travel and increase the demand for different kind of infrastructure. Mmm, yes. But I think crises reveal as much as they create, or perhaps they do both simultaneously – they create windows of opportunity for people finally to put into practice something they’ve been wanting to do but also worrying about. Unfortunately, a whole series of crises is coming our way, if (as any scientist would) you believe climate science. So cycling might be embraced first in the face of disruption, and perhaps only later as part of a more coherent strategy of resilience and adaptation to the threat of further crises. Maybe like Vienna’s RadJahr 2013 marketing campaign? The slogan was ‘Setzt Freude in Gang’ (‘Sets joy in motion’). Sorry I can’t find English site that had more examples. Thanks Derek. Yes, that’s the kind of thing – though it has to be more than glossy posters. We need to explore and portray in images, but also explore through words and stories and – perhaps most importantly – speech the kind of worlds where the bicycle will be central, and how much better those worlds are/will be than where we are right now; and how IT’S GETTING ON A BIKE that gets us from here to there. You are absolutely correct “we need to create more seductive visions of the cycling future”. Apple – created an entire culture around the iphone. Let’s create our own iBike culture. Dave, I enjoy reading your articles. For me the key issue is that whilst cycling is clearly a feature of a better world, I am not certain that cycling is a route to a better world. I believe a more fundamental political upheaval is needed based on concepts of equality, civility and health. Have both Car and BIKES ! Car sits so long between use that the cold drains the battery , but keep backup in house for the Jump Start needed ! Fact is the car is only used for the longer trip , over 50mile return , why would you drive when the sun is out and the roads are dry ? Plenty of material there to consider rather than rehashing here ? Will be plagerising some of the above material , GOOD Food for thought ! Belated thanks Skippy (I’ve gone off the blogging boil of late). I’ve just been checking out your adventures with interest – that’s a very nice blog, and good on you for raising issues around the behaviours of road users (and especially the widespread contempt shown towards cyclists). We’ve a way to go, but social attitudes are always changing and I’m confident they’ll gradually turn in cycling’s favour. Feel free to take whatever you want from here, and good & safe cycling! It sometimes feels like we need somebody/something to do for British city cycling what Dave Brailsford/Sky did for British sports cycling, eh? Ever since I was a kid, British pro cyclists have had the potential to be up there among the world’s best (and occasionally against all the odds someone made it). But it took a big step change in ambition, resources, belief and strategy – with Sky – to turn the potential into major and solid-looking (i.e. sustainable) success – to move from the occasional success to systematic success. These days wanting to see more British city cycling is much like being a fan of British cycle sport through the 1980s, 1990s and 2000s – always scouring around for positive signs of ‘something about to happen’, and getting tremendously excited by the odd success (indeed, isn’t success so much sweeter when it’s less expected? I think I got more excited, back then, by for example Malcolm Elliott winning a stage of La Vuelta, or Chris Boardman winning a Tour prologue, than I do these days when success has become more reliable!). 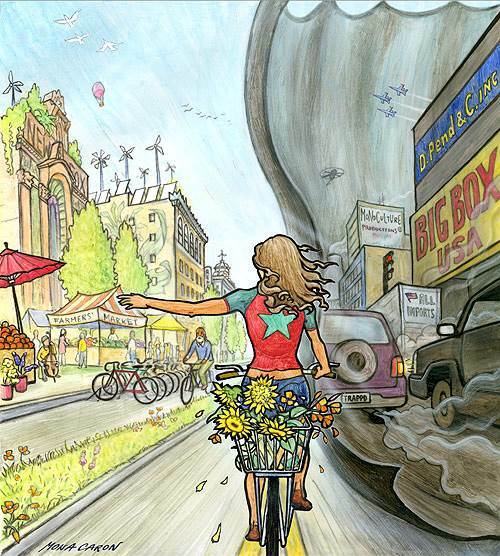 So we await a Sky-like total systems approach to city cycling. Maybe Bristol will get there first, then everybody else will want to copy?! Haven’t been there but groups like Critical Mass and authorities seem to have put in a lot of work. Sam: you’re right to mention leadership, the lack of it undermines many efforts in the UK. Thanks Derek, there’s a lot of very seductive imagery in there, and barely a helmet in sight! I blogged about Vienna earlier this year, after I took part in Velo-city there; it’s an interesting example of a car-centric city getting quite serious about boosting cycling. On a slightly critical note, I’d point out the exclusivity of this pro-cycling imagery; I think everyone in that PowerPoint presentation is white; almost all are slim and look pretty affluent. Maybe such representations sell cycling to some, but do they do so at the expense of others? Certainly in 21st Century Britain, I’d hope more people – irrespective of ethnicity, ‘ability’, size etc – could see themselves in positive images of cycling. It strikes me there is a lot of talk about cycling and the future of our cities if you care to look. The trouble is this talk stays within the bubble of interested parties (cycletopia is a good example here). There is a distinct lack of positive imagery or seductive ideas that make it into wider consciousness. Where wider debate does happen it seems to centre around conflict on the streets or negative aspects of cycling and pedestrian safety. Even the commendable Times campaign spends too much time stuck in this ‘news’ agenda. Advertising is limited in impact because the money spent on it will always be infinitesimally small compared to the amount spent by the car industry. In addition, the narrow remit of cycle advertising (e.g. safety) seems to reinforce the unhelpful lines of the existing debate. 1) what alternative initiatives cycling and pedestrian advocates can embark on that may help change the terms of the debate in the mainstream? 2) what the brief would be for the ideas and imagery that might uderpin these initiatives? Here are some suggestions of other ways that might raise the profile and shift terms of the debate e.g. These are things I’ve made up on the spot and I’m sure you’d have better Ideas. The point is to introduce positive visions of cities that don’t begin in the narrow circles of cycling advocacy or repeat the narrow terms of the debate as it is currently played out in mainstream media. 3. New work that puts bicycles and cycling at the heart of these future urban visions. One task is to encourage (rather than simply wait for) people and organisations in all walks of life to mainstream cycling within their own practices. I know some such work has been going on a long time, but in a sort of vision-free way (which makes such work less effective). I think the arts & culture (broadly defined) have a big role to play in filling out (making more real) the visionary-vacuum. In other words, we need to tell stories (visual as well as verbal) about mass cycling to help make it ‘real’, and help make it happen. One reason the idea of mass cycling hasn’t taken popular hold is because it’s being spoken about – as you say – in a very small world of (mainly) advocates and academics. We need others to jump on board to make it more compelling and more likely. Lacking a trumpet, perhaps I can rasp my own kazoo a bit here. Using Twitter and Flickr I have found that a positive-looking photograph or two might add a grain to the general culture of how good cycling can be: some sort of antidote to the YouTube Horrors that hog webusers’ attention. I have been collecting “Positive Images Of Cycling” from my own snapshots and putting them on Flickr, It’s all here: https://www.flickr.com/photos/samsaunders/sets/72157633370527869/ and can be viewed as individual images, a slideshow, a panel or whatever Flickr is up to at present,. By declaring them all to be copyright free, I have found that from time to time someone adopts one for some other project. Splendid stuff Sam – keep it up! Hello Dave, I had a very enjoyable dinner with your wife last week over which we discussed most everything BUT cycling. Anyway, it did make me think that I hadn’t seen a Thinking About Cycling blog post for a while. For some reason I seem to have stopped receiving the automatic notifications. Not to worry – I will re-register. A propos this particular post (Different Worlds, 7January) I thought that you might find this article from Tuesday’s Guardian Sustainable Business section of interest http://www.theguardian.com/sustainable-business/reasons-business-leaders-danish-style-cycling?CMP=new_1194. We always hear about Denmark and Switzerland and the Netherlands. Nice to see some real developments across the pond. I’ve always thought, when watching the ‘box’ that American roads are so wide you could stick dedicated cycle lanes down either side and not lose any functionality. Thanks for the link to that article. Yes, I think the bicycle is being enrolled into a powerful, vibrant new discourse of ‘liveable cities’ much more in the US than here in Britain. I’ve rather lost the blogging bug these last few months, to be honest. Partly that’s conscious, as I wonder where I’m going next and start trying to get there; partly it’s unconscious – based I think on my itch for figuring out how we get people cycling having (temporarily?) abated. My current plan is to do only a few blogposts this year, whilst I re-direct my energies to other things. and whilst I broadly agree. I don’t think it’s as easy as just building it the Dutch way, because building it the Dutch way is politically very difficult in the UK. post Bradley Wiggins the political climate in the UK is the most positive it has ever been… even the Times is on side… but there’s still plenty of potential for us to frack it up and return to business as usual / roads to prosperity.